Our range of products include fully automatic hollow block making machine, hollow brick machine, automatic hollow block machine, chirag multi raw material hollow block making machine, chirag automatic hollow block making machine and chirag semi automatic hollow block making machine. Our sophisticated facilities and skilled workforce allow us to design & develop a quality assured range of Fully Automatic Hollow Block Making Machine. We use high grade material & components, which we source from reliable vendors, in the production process of our Fully Automatic Hollow Block Machines. Along with this, we provide these machines to clients at market leading prices and within the stipulated time period. We are leading manufacturer and exporter of Fully Automatic Multi function Brick Machine, Multi function Block Making Machine, Block Machine, Block Making Machine, Concrete Block Machine, Hollow Block Machine, Concrete Block Making Machine, Cement Block Machine. 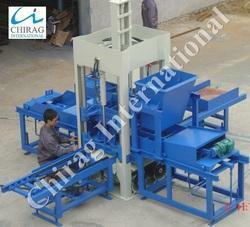 This machine is Multi functional, Could make All kinds of Blocks, Bricks and Pavers while change the Moulds. Hollow Block Machine offered are made available in compliance with defined industry standards and is based on advanced process technology as well as use of premium components that make these match up to the process needs of the customers. We make these machines available with wheel support that allows their easy movement after laying of block on concrete floor to next laying space. Chirag Multi Raw Material Hollow Block Making Machine Heavy duty machine structure, which is made of high density cast steel, is vibration proof. Chirag Multi Raw Material Hollow Block Making Machine Our machines, with harmonic cooperation between mechanical, electrical and hydraulic machines functions, guarantees a reliable and high production output of concrete products. 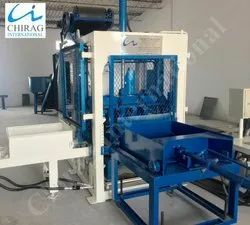 Chirag Automatic Hollow Block Making Machine We are engaged in offering a wide range of Fully Automatic Hollow Block Machine( This machine is Multifunctional, Could make all kinds of Blocks,Bricks and Pavers while change the moulds.) Simple structure; small occupying area; stable and reliable function and convenient maintaining; Simple manual operation enables the workers to learn fast; This machine combines many functions into one with low consumption. It is adopting with multi-valves in series, electricity discharging unit and compressing and vibrating organic combing unit to materialize the highest molding and density of the finished products.Chirag Automatic Hollow Block Making Machine Auto pallets conveying, pallets feeding and compulsive materials arranging have highly raised up the production efficiency and reduced the working intensity, while simple pallet conveying and feeding units can be installed for production. Chirag Semi Automatic Hollow Block Making Machine Hydraulic System: uses double high-dynamic proportional valves, which automatically adjust the oil flow and pressure, to guarantee the precise movement between the tamper head and mould. 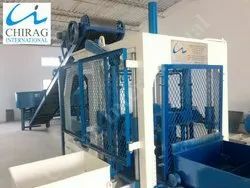 Chirag Semi Automatic Hollow Block Making Machine Highly productive moulding device, which consists 360 rotating and compulsory feeding of raw materials, platform vibrating and compression shaping, greatly improves the cycle time. The finished blocks are of good shape and high quality. 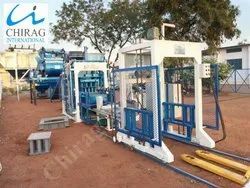 Chirag Semi Automatic Hollow Block Making Machine The moulds are changeable, and it is able to produce various kind of blocks,bricks,interlocks, pavers and kerbstones in different types, sizes, shapes, and colour layers. Chirag Next Gen Automatic Hollow Block Making Machine Hydraulic System: uses double high-dynamic proportional valves, which automatically adjust the oil flow and pressure, to guarantee the precise movement between the tamper head and mould. Chirag Next Gen Automatic Hollow Block Making Machine Highly productive moulding device, which consists 360 rotating and compulsory feeding of raw materials, platform vibrating and compression shaping, greatly improves the cycle time. The finished blocks are of good shape and high quality. Chirag Eco Friendly Hollow Block Making Machine offered are made available in compliance with defined industry standards and is based on advanced process technology as well as use of premium components that make these match up to the process needs of the customers. We make these machines available with wheel support that allows their easy movement after laying of block on concrete floor to next laying space. 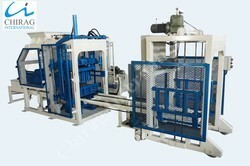 Looking for “Fully Automatic Hollow Block Making Machine”?